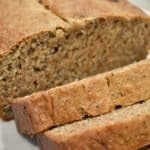 Easy and healthy, you will love this banana bread! 2. Mash bananas in a large bowl. Add the yogurt, melted butter, eggs, brown sugar, and granulated sugar to the bowl. Beat with a mixer on medium speed until combined. 3. Add the flour, flax seed, chia seeds, baking soda, salt, and cinnamon to wet mixture. Mix with a spoon until combined. Pour batter into 9 x 5 inch loaf pan coated with cooking spray. 4. Bake loaf for 55 minutes or until a wooden pick inserted in center comes out clean. Remove from oven; cool 5-10 minutes in pan on a wire rack. Remove bread from pan and cool completely. Enjoy!